I was making coffee one morning and stepped in a puddle of water in front of the sink. Since I was the first one up, only the cat could have made this puddle unless there was a leak under the sink. Either way, this was not a good sign. Since the cat has never made a puddle before, I opened the cabinets and looked under the sink. What a mess! The entire area was jam packed with cleaners, soap, detergents, cleaning supplies and trash bags that things were stacked on top of each other. It was hard to even see the floor. As I moved a few things away, it was obvious there was a leak somewhere under the sink. This kind of thing never happens at a good time (Murphy’s Law). I hadn’t even had coffee yet. I pulled everything out, salvaging what I could and cut off the water supply and mopped up the water. With the water supply turned off, I couldn’t see any leaks, so I turned the water supply on again and still could not see any active leaks. There had been a very slow drip for quite some time. 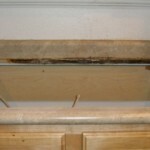 I could see there was a small are in the back of the cabinet where mold was starting to grow. We had been negligent and now we were going to pay the price. The main question was going to be… How big of a price? 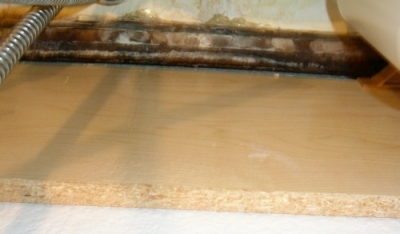 I had two problems, water was leaking from somewhere under the sink and mold was growing. I had hoped all I needed to do was find and stop the leak, but now I have to determine how bad the mold was and find a way to get rid of it. 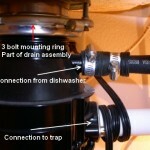 Basically, the leak could be any connection in the water supply or at any drain connection. I did not actually see any water leaking until after I turned the faucet on and then turned it off again. 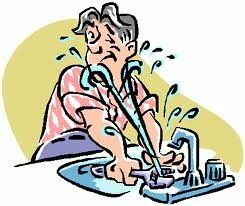 At first, the water appeared to be dripping from the garbage disposal, but in fact, the leak was coming from the extendable hose of the faucet and only appeared about 15 seconds after the faucet had been turned off. When I tried to find the exact location of the drip, I found a bigger mold problem growing under the counter top close to the faucet. So in addition to the water I could see dripping into the cabinet, water was also soaking into the fiber board of the counter top and was causing the mold to grow. This fix was going to require more than tightening a nut or two, this was going to require removing the sink to get at this mold problem. I knew it was going to take some time to dry everything out and to kill and clean up the mold. My wife was going to be gone all the next week visiting relatives. My plan was to stop the water problem from getting worse until then and pull everything out while she was gone. I would be “batchin’ it” anyway and could get by a few days without a kitchen sink. So I duct taped plastic sheeting underneath the cabinet, making a giant funnel to temporarily directed all the dipping water into a plastic pan until I had time to fix it. I emptied the pan everyday, but the water was dripping so slowly, it wasn’t necessary. Only about two gallons of water leaked all week. That doesn’t sound like much water, but it that is enough to make a mess and start growing mold. After I took my wife on the airport, I returned home and stood in the kitchen and felt sorry for myself. 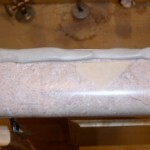 I was batchin all week, and instead of planning a fishing trip or plopping on the couch to watch Sports Center and eat chips, I had to pull out the sink and go to war with mold. 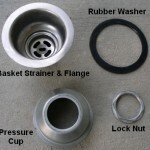 Next, how to remove a kitchen sink and how to remove a garbage disposal.